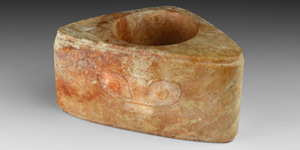 A carved ritual cong of rounded triangular form with central waisted vertical piercing and rebated edges, with two shallow-relief human-like visages, one with widely separated ears, in a mottled buff-orange jade. 900 grams, 13.5cm (5 1/4"). Fine condition; light abrasion at corners. Property of a Brussels gentleman; peviously in an old french collection, circa 1950. Cf. Ross, Jessica, Mysteries of Ancient China, British Museum, 1996, item 16 for similar examples.